Nothing squashes holiday cheer or puts an end to the fun faster than an inflatable bounce house or outdoor decoration that falls flat. While many of these products are designed to be stored until needed, rips, tears and mechanical or electrical issues can keep them from properly inflating when you're ready to use them. 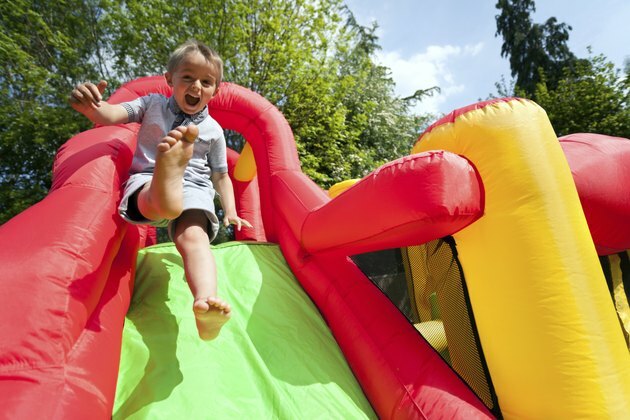 Rough use causes holes and tears in inflatable play structures. If the pump works properly, but the inflatable won't inflate, look for areas where air could be leaking. Start by checking whether all zippers connecting each section are fully zippered and all sections of material are arranged as they should be. Feel for leaks along seams or look for obvious tears and holes. The key to repairing these leaks lies in the material from which the inflatable is constructed. For fabric holiday decorations, use a standard needle and thread, clear packing tape or a tent repair kit to seal holes. Patch vinyl sections using a vinyl or swimming-pool repair kit. Many of these vinyl patches also work on bounce houses and other play structures, although manufacturers often provide their own repair kits designed to work with the products. An inflatable that fails to inflate could be sitting in the wrong spot. Make sure the inflatable is completely unfolded and lying flat on a level surface. Check that the fan used for inflation is sitting on a level, stable surface. These fans need to take in air to inflate your decoration or play structure; if air-intake vents are blocked by grass, leaves, carpet or any other material, the fan won't be able to take in air. Many holiday inflatables rely on a simple electrical fuse to function. If this fuse fails, the fan motor won't work and the item won't inflate. Check the area where the cord meets the inflatable to find the fuse box. You may need a small screwdriver to access the fuses. Pop out the bad fuse by hand and take it to a hardware store for a replacement. If the item has two fuses, one is a spare, so you may be able to get the inflation process moving by swapping the two fuses. Inflatables should be placed as close to the power source as possible and plugged into an outlet with the proper voltage based on the manufacturer's recommendations. If your inflatable has a GFCI on the plug, try hitting reset if the fan doesn't turn on. If all else fails, the fan motor may have gone bad during its time in storage. In this case, contact the manufacturer about obtaining a replacement motor. In the cases of holiday inflatables, you may be able to purchase a cheap inflatable to harvest the new fan for your old favorites.